Have you ever been to a conference where more than half the attendees are tapping away on smart phones, laptops or tablet computers while the main keynotes and panel discussions are underway? Welcome to the world of social media conferences, where attendees practice what they preach – firing off tweets, microblogs, status updates and audio podcasts as they process information being presented by the speakers in front of them. 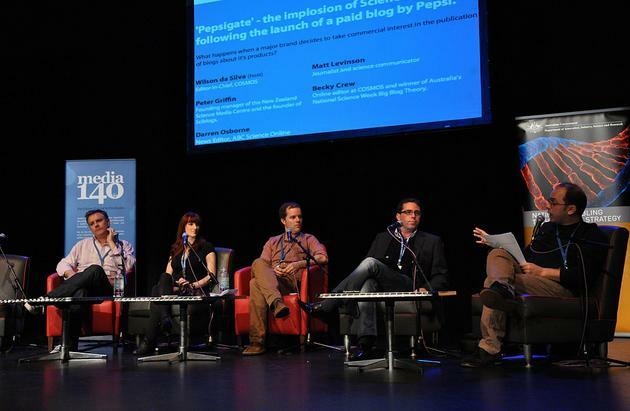 That was the scene at Media140 in Brisbane last week, a conference that examined the pros and cons of using social media platforms for discussion of and dissemination of information about science. I spoke in my capacity as manager of the New Zealand Science Media Centre on the Pepsigate scandal of July 2010. Just to refresh your memory, that was the blogging debacle that resulted when respected US science blog network Scienceblogs.com, the home of hugely popular blogger PZ Myers, launched a blog featuring content from food giant Pepsi. While the blog was sponsored by Pepsi and was to feature blog posts from Pepsi scientists it lasted barely 24 hours, by which stage a number of popular bloggers had deserted Scienceblogs. The network has recovered reasonably well from the Pepsigate incident, though there are less bloggers than there were before and science blogging networks have proliferated since then. Not long before the panel discussion started, (listen to the podcast here), news came through that National Geographic had taken control of Scienceblogs, which is owned and will continue to be majority owned by Seed Media. The move suggests National Geographic, already a sponsor and part owner of Scienceblogs has come to the rescue with some badly needed capital for Seed and Scienceblogs. You see, Seed is yet another traditional publisher trying to make a go of things online and as founder Adam Bly explained in a letter to his bloggers in the wake of Pepsigate, display advertising on science blog networks doesn’t pay the bills for a commercially run operation. The panel discussion reflected on Pepsigate and what lessions we can take away from it about the fragility of trust on the internet. The issue of trust was central to the conference itself which government officials and journalists attending I spoke to seemed most concerned about the trustworthiness of sources of science-related information and and about maintaining their own integrity and credibility. – An ill-conceived attempt to bring in revenue for Scienceblogs that failed not only because of the practical difficulties of featuring paid for content from a beverages maker, but because the decision was so out of step with the ethos of Scienceblogs and its community of volunteer bloggers. – There was already widespread dispondency within the Scienceblogs community which was the real reason for the exodus of top-notch bloggers. – Scienceblogs has survived and the deal with National Geographic will ensure its sustainability. But will it ensure the independence of its bloggers? Will the discourse be toned down or censored to meet National Geographic’s more mainstream values? – Science blogs have fragmented partly as a result of Pepsigate, which means there are pockets of science bloggers all over the place now. That’s not such a problem in the age of RSS aggegators, Twitter and social media, but there is still room for blog networks as a way of sampling and discovering a wide range of writing. – No one has figured out how to make blogging pay – maybe with the exception of Ariana Huffington, who has shown that you can build a valuable business on the back of free labour, but the model is rarely equitable to all concerned.